Nikki Garrett looks pretty darn good in her golf attire, and she looks pretty darn good in her calendar "attire." How does she look in her civilian clothes? I'd say pretty darn good. Notice what it says on her t-shirt? It's the URL of the calendar for which she recently posed: www.womensgolfcalendar.com (see several posts below for pics from the calendar, including Garrett's). Hat tip to the forum posters at iseekgolf.com for the image above, and to photographer Anthony Powter. This is Nikki Garrett (a k a Miss November), the 2006 Ladies European Tour Rookie of the Year, as she appears in "Top Shots: Women of Professional Golf 2007 Calendar," the calendar featuring Australian Ladies Professional Golf Tour players. Click the image for a larger view. The calendar can be purchased at www.womensgolfcalendar.com. Some of the proceeds benefit breast cancer support and others benefit a scholarship fund for the ALPG. The final stage of LPGA Tour Qualifying School gets started next week - Nov. 29-Dec. 3 at LPGA International in Daytona Beach, Fla. - and quite a few of the golfers listed in our sidebar will be there. Ashley Prange, Anna Rawson, Angie Rizzo, Kristina Tucker, D'Rae Ward, May Wood. These are all golfers we've featured on Golf Babes or whose Web site appears in the sidebar. I wish they all could make it, but there are 139 golfers in the field and only 15 of them will emerge with fully exempt status on the LPGA Tour for 2007. Best of luck to Tina, Katie, Brandi and the rest of our friends. Remember a couple years ago when the USGA banned sales of Natalie Gulbis' calendar at the U.S. Women's Open because they deemed it too hot? There's a calendar due out any day now featuring golfers from the ALPG (Australian Ladies Professional Golfers) tour. The calendar was shot to raise money for breast cancer research, with funds pegged to go to Australia's National Breast Cancer Foundation. We've been getting updates on this calendar from one of the golfers featured in it, who implied that it was pretty hot. Well, it turns out it's too hot for the NBCF. A print run of 20,000 was taking place last week in hopes of getting the calendar out in time for this past weekend's Australian Open. But midway through the run, the NBCF called a halt to it, saying they didn't want their logo used with the calendar. The calendar is still going to be printed, but now its release has been delayed a bit. Proceeds will still benefit breast cancer research, but now the McGrath Foundation. Among the golfers featured in the calendar are Nikki Garrett, Sarah-Jane Kenyon and Kristie Newton. Nisha Sadekar and Play Golf Designs, Inc.
Say hello to golfer and businesswoman Nisha Sadekar. Play Golf Designs (PGD) is a Las Vegas company that provides golf outings and management services to individuals, companies, corporations and charitable organizations at golf courses around Vegas. It's a player-run organization that selects touring golf professionals to promote themselves and their golf talents through outings and events. 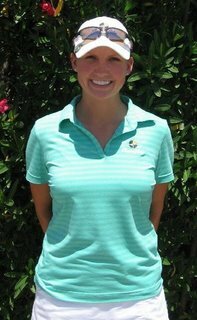 Ashley Prange of "Big Break" fame is the director of player development for PGD. How does it work? Let's say your company is having its annual meeting in Las Vegas, and wants to set up a pro-am for its employees and clients. Nisha and Play Golf Designs will arrange and manage the event, including the participation of professional golfers who have LPGA Tour, Ladies European Tour, Futures Tour or other professional golf tour experience. Aree Song, Anna Rawson, Candy Hanneman, and "Big Break" players Ashley Gomes, Bridget Dwyer, Sarah Lynn Johnston and Jeanne Cho are among those golfers who work with Play Golf Designs. And, of course, there's Nisha herself, and the aforementioned Ashley Prange. Not to mention our pal Tina Miller. But PGD's services aren't just limited to group outings. Any individual golfer who is headed to Las Vegas can set up a round of golf with a female touring professional at a top Las Vegas course. Want to meet Prange or Song for lunch in the clubhouse, then 18 holes of golf? Check with Play Golf Designs in advance of your Vegas trip and you might be able to arrange it (bookings are subject to a player's availability, of course). You can learn more about Play Golf Designs on the company's Web site. And I'll be working with Nisha over the coming months as we feature more Play Golf Designs golfers (and hopefully, more of Ms. Sadekar). Play has wrapped up at the Futures Tour qualifying tournament, and some good names are among those who emerged with exempt or provisional status. Forty to 50 golfers get exempt status through this tournament, although the final reckoning of everyone's status doesn't take place until after the completion of the LPGA's final stage Q-School qualifier later this month. The winner was Korean In-Kyung Kim, who won the USGA Girls Junior Am last year. Runner-up was Paige Mackenzie (that's her pictured above), a Curtis Cupper and University of Washington product. Auburn's Maru Martinez, runner-up to Morgan Pressel at the '05 U.S. Women's Amateur, came eighth. Perry Swenson, the University of Texas grad pictured below, was tied for 13th, along with USC's Irene Cho, among others. Amanda McCurdy tied for 25th. Hawaiian Shayna Miyajima (pictured below) was tied for 30th. 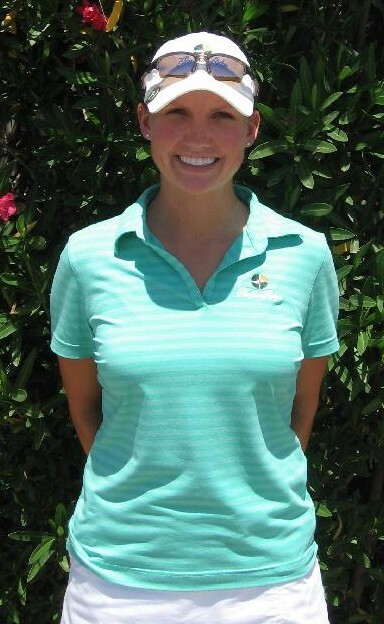 Cactus Tour player Nicole Keller, below, was tied at 34, and "Big Break V" contestant Julie Wells tied at 45. Haven't heard of Kiran Matharu? Don't worry. You'll be hearing plenty about her soon enough. Kiran is the next great player to emerge from Great Britain. Still just 17, she'll be playing in the Ladies European Tour Q-School coming up. Stupidly, LPGA commissioner Carolyn Bivens rejected Matharu's request to play the LPGA's qualifying tournament. Matharu, a protege of Nick Faldo, played on the GB&I Curtis Cup team this year, recently won the Ladies English Amateur Championship, and has placed highly in her few appearances at professional events. This is the young Australian golfer Nikki Garrett, who won the Ladies European Tour's Rookie of the Year award a few days ago. The mugshot below is from her LET profile. Amy Lepard had been a hot subject at Golf Babes since the Ryder Cup, when some of the British tabloids remarked in articles about her, well, babe-ness. What does Amy Lepard have to do with the Ryder Cup? For those of you who don't know, she's married to PGA Tour winner Chad Campbell. What does Amy do? She's a songstress with a burgeoning career in music. You can visit her Web site, www.amylepard.com, to hear some of her music. Scroll to the bottom of the home page, then click a song title to get a listen. That Web site is undergoing some renovations right now, but I'm told there will soon be some new pics posted. In the meantime, for updates about Amy, you can also check out her myspace site, www.myspace.com/amylepardmusic. Her album, "On My Own," was released in 2005 and you can find it on Amazon.com. I asked Amy if she plays golf herself. "Yes," she replied, "but only until I find the cold beer." The beautiful Katie Bakken will be playing in the final stage of LPGA Qualifying Nov. 29-Dec. 3, chasing her LPGA Tour card. We certainly hope to see her on our television screen often next year. A Minnesota native, Katie B walked on at the University of Minnesota and then played well enough, including winning the Peggy Kirk Bell Classic, to earn her scholarship. After graduation, Bakken won the 2001 Minnesota State Women's Open, and also played her first LPGA Tour events that year. Katie played in Asia and Australia, then full-time on the Futures Tour in 2002 and 2003. Then she qualified for the Ladies European Tour and played there in 2004, 2005 and this year. She set a course record at the LET Tenerife Ladies Open in 2005. Her career has certainly been a steady progression upward through the ranks, and last month she played her way in the Finals of LPGA Q-School. If history holds, we'll see Katie B on the LPGA Tour soon.